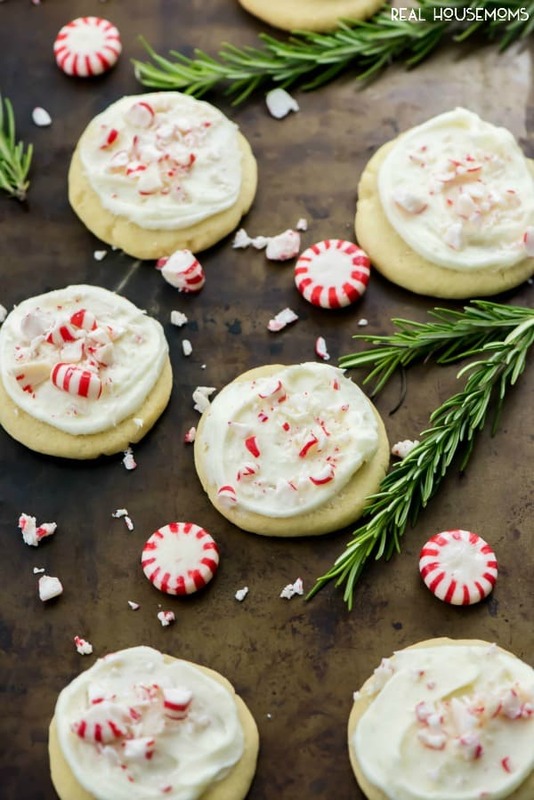 This PEPPERMINT SUGAR COOKIES recipe has got to be on your holiday baking list this year! Your Christmas cookie plate isn’t complete without them! 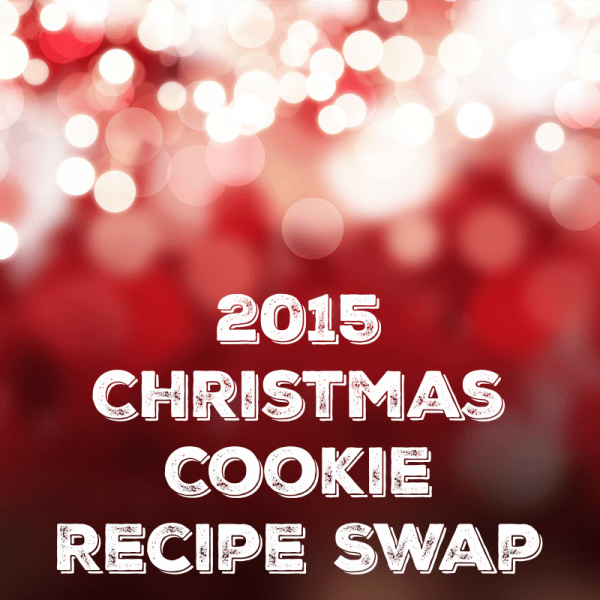 The 2015 Christmas Cookie Recipe Swap is hosted by our very own Julie from Bread Booze Bacon and the manager of this crazy, mad house we call Real Housemoms. She is one crazy talented, patient and organized woman to be able to wrangle me and keep me on task. 🙂 Be sure to hop over to Bread Booze Bacon to check out the other cookies that were shared. 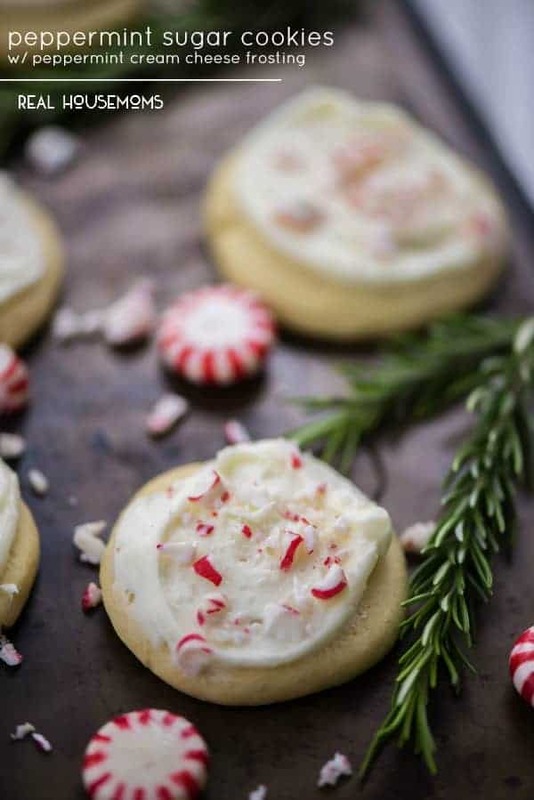 This PEPPERMINT SUGAR COOKIES recipe has got to be on your holiday baking list this year! Your Christmas cookie plate isn't complete without them! In a stand mixer with a paddle, cream together butter, shortening and sugar until fluffy. Add egg, white, vanilla and peppermint, mixing until combined. Transfer dough to an airtight container and refrigerate at least 2 hours. Scoop 1 tbsp of dough and create a ball. On a lightly floured surface, flatten into a ½” thick disc. Move to lined cookie sheet. Bake 9-12 minutes, cool 2-ish minutes before removing to a cooling rack to cool completely. In a bowl, cream together cream cheese and butter until fluffy. Add extract. Slowing mix in powdered sugar. If too thick add milk. My daughter made these for Christmas. They are delicious! Thank you for the recipe!